Consumers. Use the dynamic search tools to compare popular cereals for nutritional quality and marketing to children and teens. Researchers. Understand the methodology and key measures employed by the Rudd Center to compile our rankings. The 2013 FACTS about fast food nutrition and marketing to children and teens. In 2010, the first Fast Food FACTS report documented the nutrition quality and marketing of fast food to children and youth. Three years later - using the same methods as the first report - Fast Food FACTS 2013 reveals how the fast food nutrition and marketing landscape has changed. Explore the Fast Food FACTS website to learn more about the restaurants, menu nutrition including kids' meal combinations, marketing techniques, and the science behind the FACTS. For the detailed report methods and findings see the Fast Food FACTS 2013 Report , Fast Food FACTS 2013 Report Summary, and Report Summary in Spanish. The videos and infographics below highlight some of the report's findings. Fast Food FACTS was developed by the Rudd Center for Food Policy & Obesity. Learn more about the Rudd Center's research on food marketing to youth. The 2010 report and report summary are available. 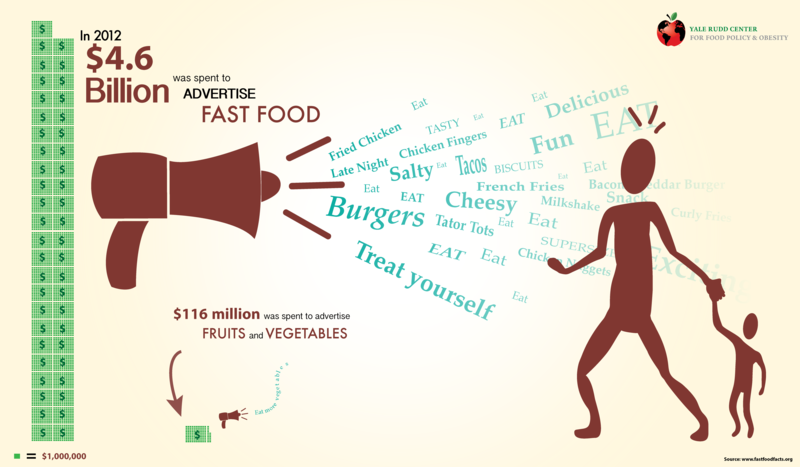 In 2012 the fast food industry spent $4.6 billion to advertise mostly unhealthy products, and children and teens remained key audiences for that advertising, according to a new report by the Yale Rudd Center for Food Policy & Obesity. The report highlights a few positive developments, such as healthier sides and beverages in most restaurants' kids' meals, but also shows that restaurants still have a long way to go to promote only healthier fast-food options to kids.